Stayed for one night. Older building but very clean and quiet. The bed was extremely comfy and the shower’s water pressure was amazing. 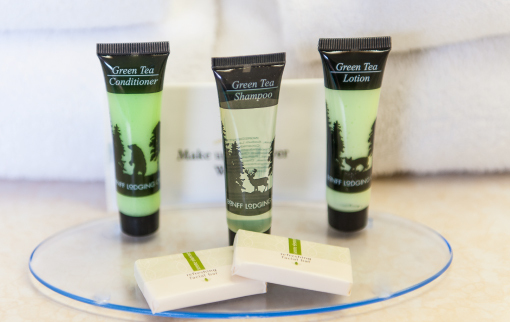 All amenities are across the street at the inns of Banff. This is a good place for a night or two of on a budget. Also pet friendly and my dog loved it! This place looks rather run down from the outside but inside its sufficient. Beds are good and its clean and the rooms are a good size. It’s an old hotel that’s seen its good days but if your on a budget or just fancy a night or two out in Banff then this place is ok. It’s a long walk into town but there are many restaurants and everything you really need close by. Lot of nice walks, pet friendly, and the Inns of Banff has facilities over the road, just a short walk away that you can use as part of the deal, so overall its a nice reasonably priced place to stay to get away from the city. This hotel in general is a lot cheaper than the others in Banff with probably a bigger room. It’s got it’s own living room separate from the bedroom which gives you a lot of free space to move around inside the hotel, which is important for our toddler. It’s not a luxurious hotel, but it suited us quite well for 4 nights. If you have your own car, you can reach any part of Banff in minutes from this hotel. If you can only walk, this hotel is about a 10min walk to “downtown” Banff. I was pleasantly surprised with this hotel. The bed was very comfortable and you can use the amenities across the street at the Inns of Banff. The room was quite large and had a refrigerator which was great. Nice bathroom. Overall, a great and less expensive place to stay. It is a bit of a walk to downtown but the room came with transit passes, so we didn’t have to do the big walk. I enjoyed my stay so much that I will be staying here again this weekend for my birthday with girlfriends! We stayed here during thanksgiving weekend, and we could not have been happier. The room is very large and bright with the huge windows, and the bed was very comfortable. You could not hear anyone in the other rooms, since there are cement blocks walls, which is great. It was very nice that it was at the far end of the town, so very quiet, and the wifi worked great. You get bus passes with the room if you ask, which was handy in the rain, but even walking it is only 20 min to get to the action. All in all, very good value for your money! While coming for a ski vacation to Banff, Bumpers Inn was the perfect place to stay! Out of all the hotels I have stayed in while travelling to Banff, Bumpers Inn provided us a romantic ski getway in their cozy quiet, clean, and quaint rooms. For the price it is a great bargain and a great place to stay. Love the location; right off Banff Ave; far enough from the hustle and bustle of downtown but close enough to walk to. Quiet, two-storey hotel on the edge of the woods with a patio and several Adirondack lawn chairs in the central area to rest your bones after a tiring day of sightseeing. Totally woodsy with pine trees everywhere. I am a local from Calgary and I stay at this place when I can afford to sleep in Banff. This little hotel is the best value you will find in Banff. For a long time it was affordable but now it’s on par with other Banff accommodation because of tourism pressures. I think it’s still better then other places for the price because it’s private (very raer for Banff) located in front of a forested place where deer roam – you can even go for a walk in there.